You’re right, this is turning into the most sparse Kurma blog month ever. I am doing a marathon effort looking after my Dad and my 12-year old son Nitai, and that doesn’t leave much time for the luxury of blogging. But hey, cup half full, here I am! Last night I chilled-out in front of a fascinating SBS documentary about the ultra-environmentally-conscious desert-dwelling Bishnoi people of Rajasthan. 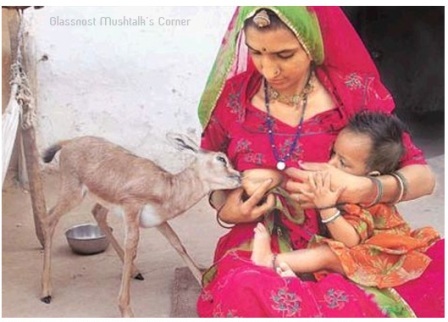 As the award-winning ‘breast-fed stray faun’ photo above shows, the Bishnoi are serious about quietly practicing what they preach. Never cut a green tree, but wait for a tree to age and die and then use it as timber. Bury your dead simply, so that the earth assimilates the flesh – and you save too, the wood needed for a casket or a cremation. Practice cleanliness and a high level of hygiene, for these will guard you from disease. Protect wildlife – they too play a role in maintaining soil fertility and in holding the balance of harmful and beneficial life forms. Conserve water for use by man and animals, by building tanks everywhere. Practice vegetarianism and be addicted to nothing – alcohol, tobacco or even tea! Do not expect or seek, alms or subsidy, from king or government; believe in self-help! Let women, those founts of life, wear bright clothes of red or orange and the men white, as a symbol of undiluted devotion to the faith. If ever you must choose to be violent, may it be in defense of a tree, an animal or your convictions; for this, even embrace death with cheer. Millet is their staple grain. 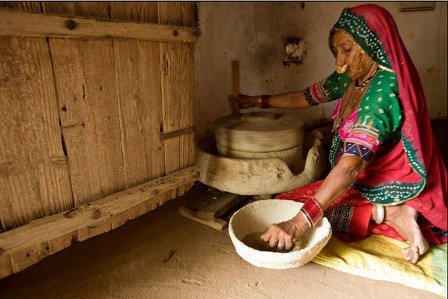 I watched them pick, thresh, hull, and grind the hearty grains, then knead, roll and bake substantial millet chapatis over cowdung fires. 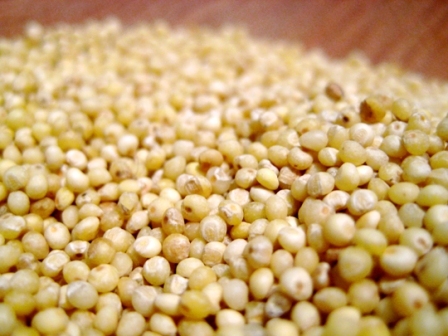 Millet is a light, versatile and inviting grain with a mild, nutty taste, distinctive without being unusual. 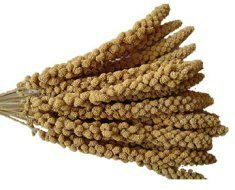 To bring out the flavour in millet, the tiny yellow grains are toasted in butter or oil before cooking in stock or water. Millet is a thirsty grain, so serve this pilaff alongside a juicy vegetable dish or soup. Serves 6. Combine the stock, corn, tomato, salt and pepper in a small saucepan, bring to a boil and simmer, fully covered, over low heat. Heat the oil or butter in a saucepan over moderate heat. Add the yellow asafetida powder, the ginger, chili, green capsicum and the millet. Saute the millet for 3 or 4 minutes, or until it darkens a few shades. Pour the simmering stock into the toasted grains, bring to the boil, reduce the heat to low, cover, and cook for about 20 minutes, or until the liquid has been absorbed, and the grains are soft. Set aside for 5 minutes to firm up. Serve hot with a sprinkle of toasted pine nuts.